Add some rustic farmhouse charm to your garden with our Toolset Garden Trellis. Metal trellis is comprised of a spade, pitchfork and shovel designed to offer support for your climbing vines. It's finished in shades of bronze and brushed copper, perfectly complementing your plants. 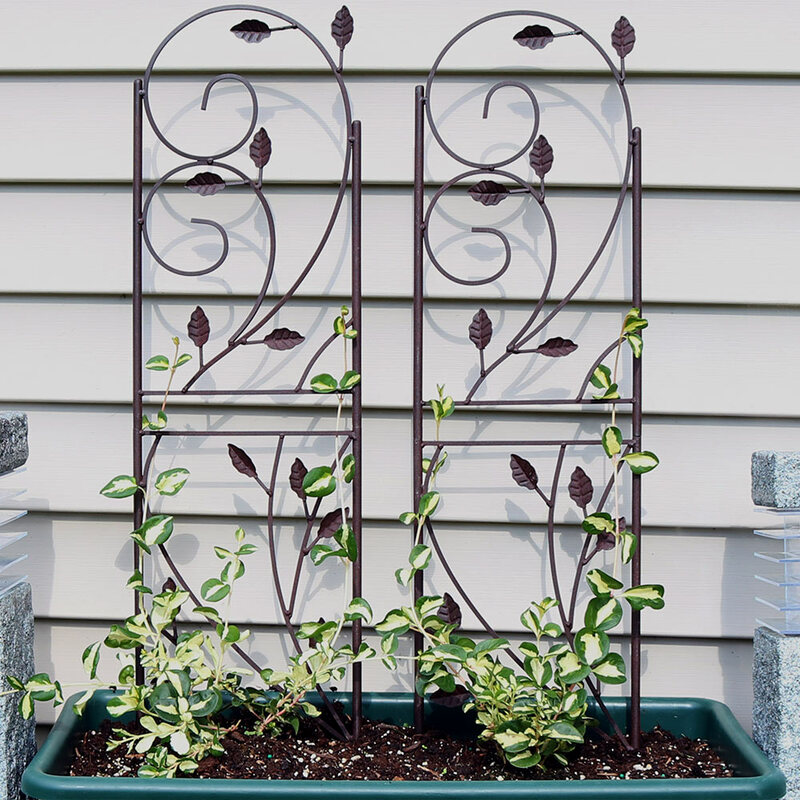 This unique metal trellis is both fun and functional, plus it's easy to install. Just push the tapered ends into the ground or the soil of a large planter. 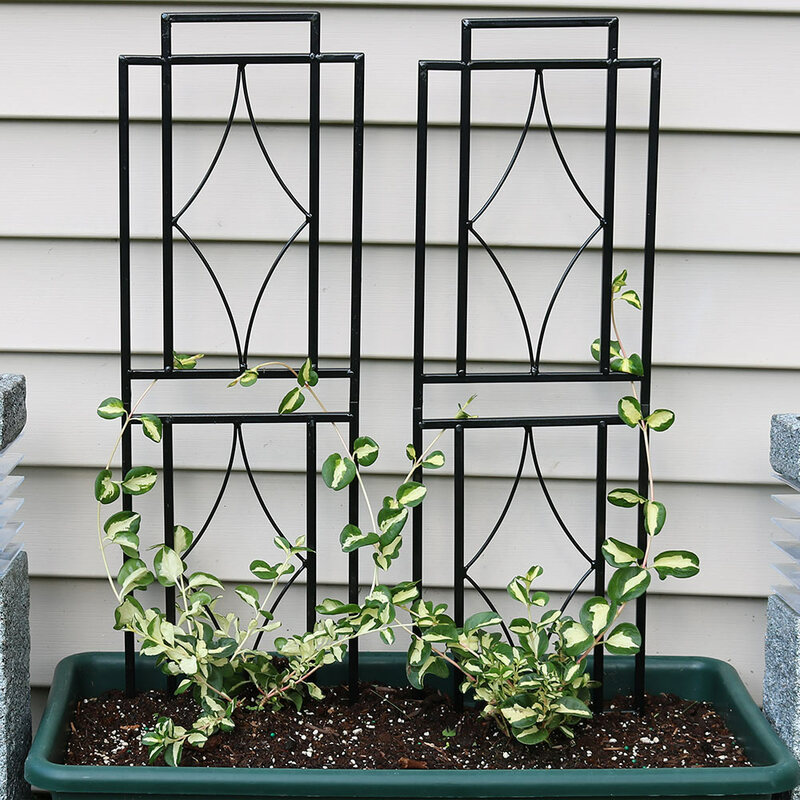 Our eye-catching Leaf Garden Trellis makes a unique statement in your garden. 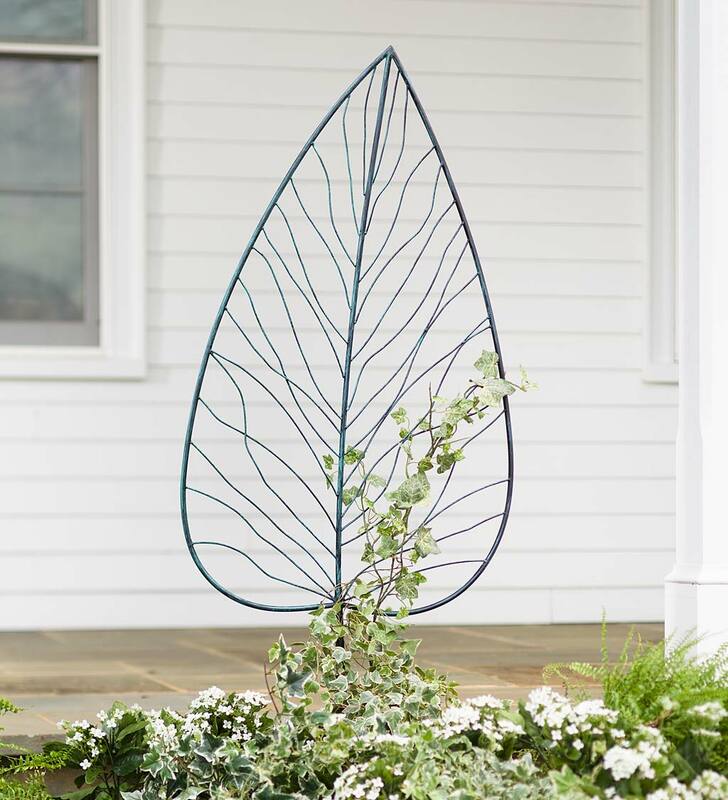 The first of its kind, this metal garden accent stands 5' tall with delicate vein detailing resembling a leaf. The attractive verdigris finish gives this trellis a timeless feel. It's ready to hold your climbing vines and flowers or stand alone as outdoor art. 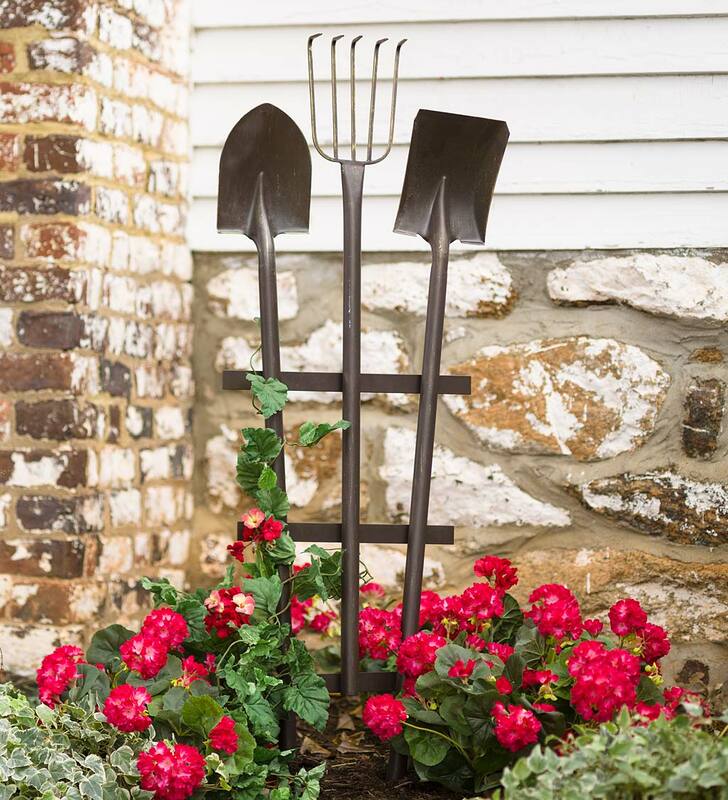 Use the three sturdy ground prongs to stake this into the ground and watch your plants grow along with the compliments! 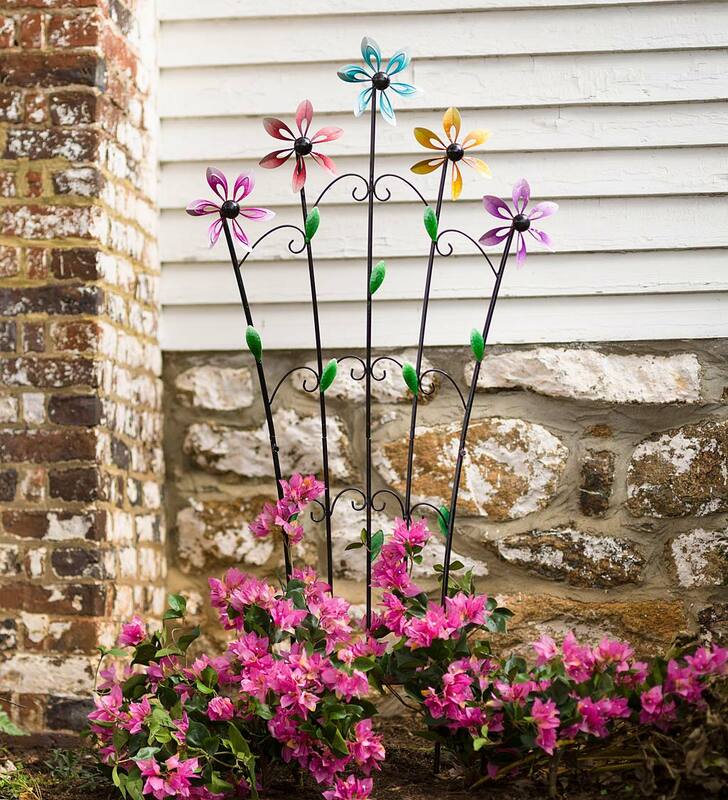 Whether it's supporting flowers or vines, or standing on its own, this Metal Garden Trellis with Spinning Flowers makes a whimsical addition to your garden. Five spinning flowers adorned in bright speckled paint top off a leaf and scroll design. You'll love the fun and function of this free-standing trellis. Metal construction with a black painted frame and colorful painted flowers and leaves. Ten inch ground stakes give the trellis extra support. Easy two piece assembly. This durable trellis cage plant support set can be used indoors or outdoors for larger potted and garden plants. 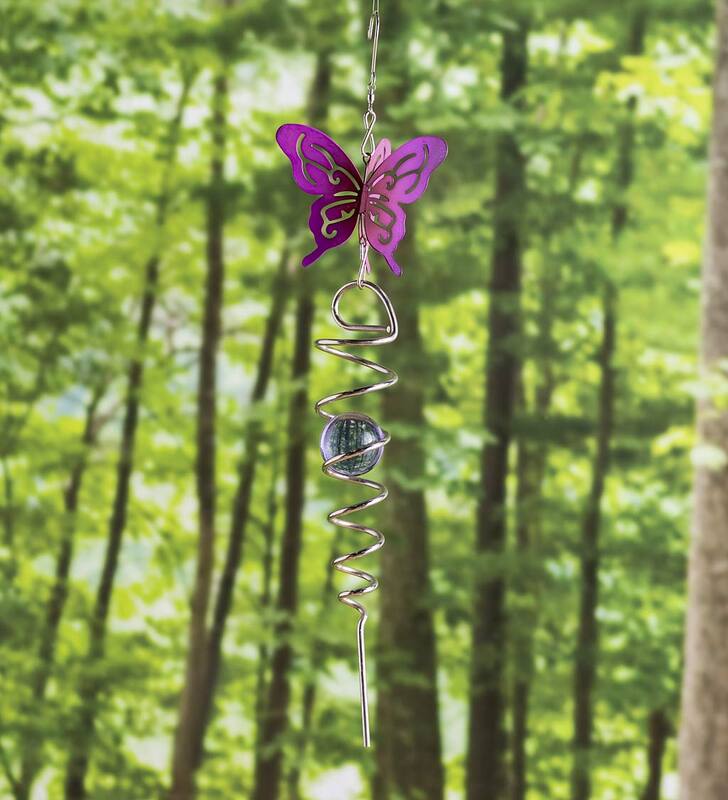 These steel supports are perfect for helping climbing plants, small vegetables, and flowers. Plus, these garden accessories will help keep fruits and veggies from falling prematurely. Use this durable trellis cage support set indoors or outdoors. This garden grid can be used with any large potted plants. Add the steel trellis plant support cage to a garden or plants to keep climbing flowers, fruits and vegetables in the best shape. This versatile and elegant trellis set can be indoors or outdoors. 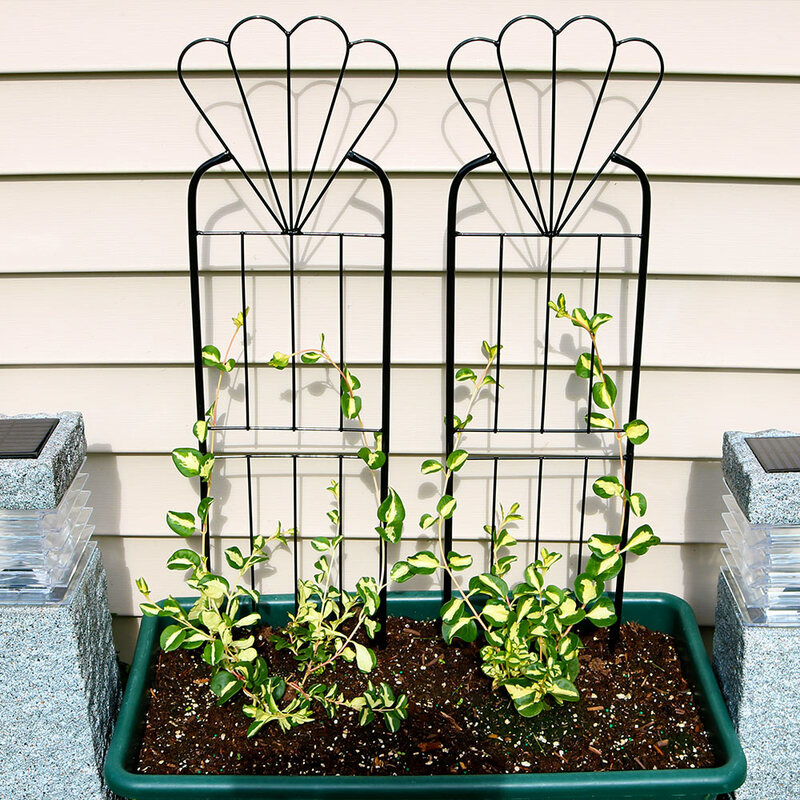 Add the steel trellis plant support cage to a garden or large potted plants to keep climbing flowers and vegetables in their best shape. Using a support for growing plants is a great way to prevent breakage and premature fruit falls. 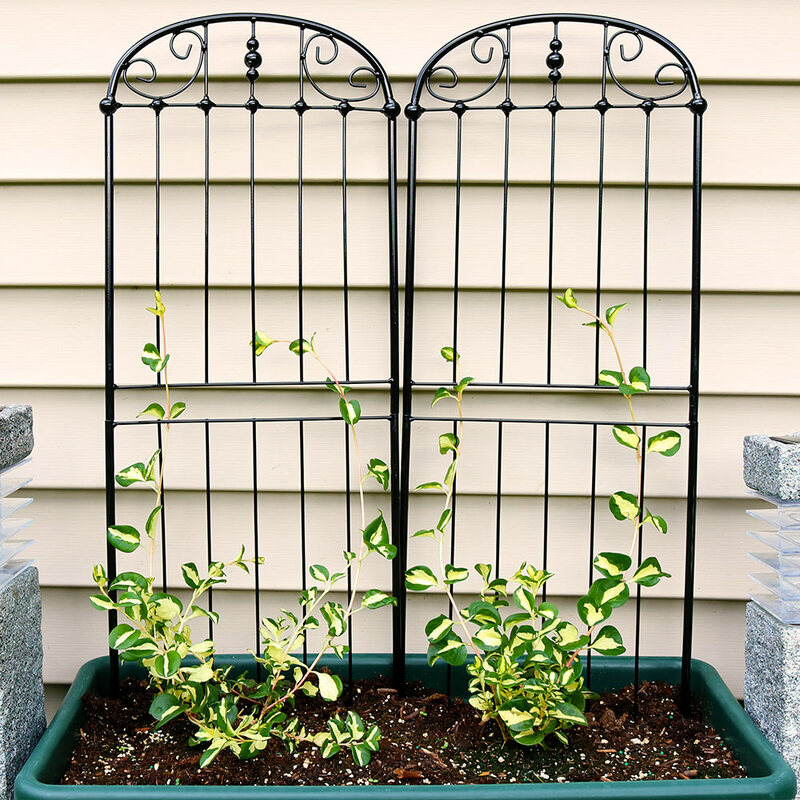 Enjoy plants in an outdoor garden or indoors with this set of 2 trellis plant supports. Constructed of durable steel wire, these trellises are perfect for use in the garden or in larger potted plants. Use these garden accessories with climbing flowers, vines and small fruit and vegetable species to keep these plants thriving. 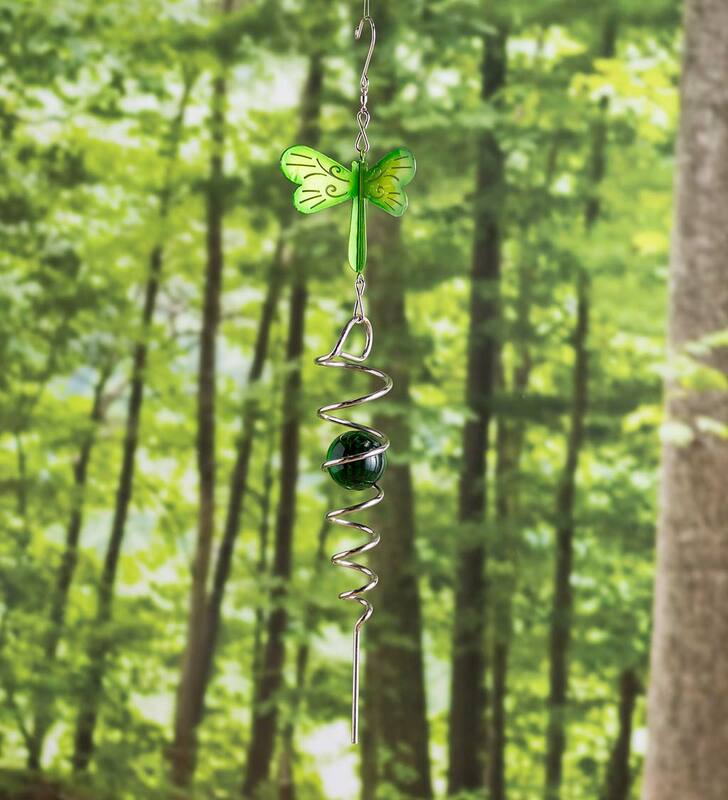 Bring quiet beauty to your landscape with our eye-catching Illusion Swirl Hanging Wind Spinner with Glass Ball. Each is topped with a different dimensional icon that helps catch the breeze. Below it a mesmerizing optical illusion will spellbind you with its calm, repetitive motion as the glass ball within the metal spiral appears to move ever downward. It's really hard to stop looking at this beauty! Hang it on a shepherd's hook, the eave of your porch, a tree or an arbor. Unique, vertical design adds a subtle hint of color and kinetics to any space in your yard. Laser cut metal design is finished with a high-gloss ombre painted finish. Stainless steel corkscrew section with glass ball; hanging hook included.